In the solar industry, we talk about NYSERDA a lot. NYS is one of the most progressive states in the country when it comes to enabling the growth and sustainability of renewable energy infrastructure, and NYSERDA's programming is a significant reason why. NYSERDA is an essential tool to helping families and businesses all across NYS have access to clean, affordable solar power. NYSERDA is short for the New York State Energy Research and Development Authority, and their vision statement is, in short, "Serve as a catalyst – advancing energy innovation, technology, and investment." The office itself distributes funds to a wide range of energy-related grant programs, including the NY Sun solar initiative. The NY Sun program provides incentives and financing to make solar-generated electricity accessible and affordable for all New York homeowners, renters, and businesses. 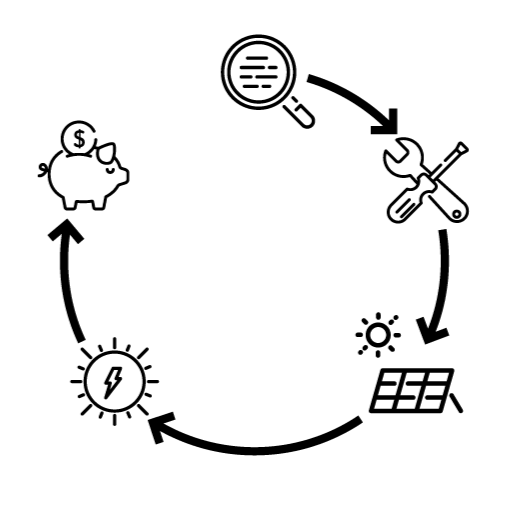 Additionally, NY SUN runs program components including training for installers and public officials, standardizing permitting processes, and educating consumers. The program has been an astounding catalyst for the NY solar industry, helping to create hundreds of Megawatts of commercial and residential solar installations, and creating tens of thousands of jobs. But all that is neither here nor there, the bottom line question remains; "what does that mean for me as a solar customer?". ​NYSERDA distributes a solar rebate to any new community solar, or on-site solar installations on a per-watt basis. The current reimbursement rate amounts to .35 cents per watt. Before you scoff and say, "well that's nothing!" Considering the scale is essential. The average Renovus customer is looking to offset energy bills somewhere in the ballpark of $100 a month. To offset those bills, the household in question would a 7.2 kW solar system. That's 7,200 watts of solar power, times 35 cents per watt amounting to around $2,520 in NYSERDA funding. All-in-all, that amounts to about 11.5% off the sticker price of a system. Rates are slightly higher for commercial systems, at 45 cents per watt up to ​750kW in size, and 25 cents per watt from ​750kW onward. While these grants are hugely important to making solar more affordable, NYSERDA is more than just a financial catalyst. Their training, lobbying and research help push the envelope and propel NY's energy future. NYSERDA is currently funded through the ​NY REV (Reforming the Energy Vision) initiative established by Governor Cuomo. Save an additional cash injection, the program's initial seed funding is on pace to expire by 2025 at the latest. Businesses and homeowners only have two years to leverage the full suite of state and local tax incentives as well as NYSERDA funding to get the lowest system costs available. Are you interested in learning more about how you could use NYSERDA to go solar at your home or business? ​Click below, and our team will draft a free estimate of your system size, cost, and paybacks.